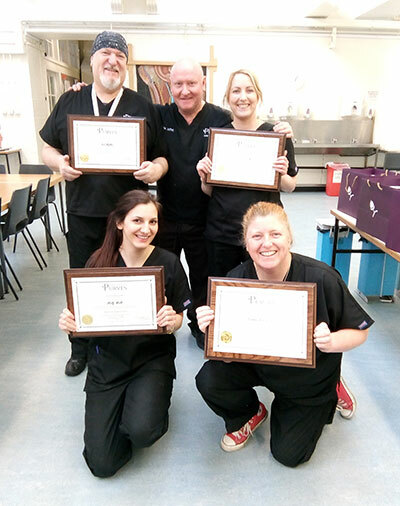 Four professionals successfully completed the William Purves Embalming Academy Post Mortem Reconstruction course in April at Edinburgh University Anatomy, run by Martin Jeffrey (MBIE Dip Fd). Rob Mifflin (Head of Mortuary bequest office, Oxford University), Pamela Murphy (M.B.I.E embalmer), Dianne Catterson (M.B.I.E Area embalmer with the Co-op) and Holly Wells (Anatomical Pathology Technician at Kings College Hospital) completed one week’s training on cranial/facial reconstruction, soft tissue repair and air brush cosmetics. Martin commented: “What a fantastic week it proved, such a pleasure to work with likeminded professionals, looking to make a difference and help families in times of tragedy. “Everyone has worked so hard, it prompted a rollercoaster of emotions with fantastic results, so well done to everyone who took part. “I would like to thank everyone involved in making this week possible, Iain Campbell, Laura Sheils and Professor Gordon Findlater from Edinburgh University. Also a massive thanks to all my colleagues from William Purves Funeral Directors for all their support.